When I was a kid we always went visiting during Hari Raya. In the mornings or early afternoon we went to Aunty Shina’s and in the evening we went to see Aunty Zan… alas that has not happened for a long long time. Aunty Shina passed away 20 years ago and I think we have not seen Aunty Zan for a much longer time. Now as a kid, the highlight of Hari Raya of yesteryears was the myriad cookies that would be placed in front of us especially at Aunty Shina’s house. The variety and quality still remains unsurpassed till this day, because they used the best ingredients to make all their cookies and sweets. It was the time when people never bought their cookies unlike nowadays. And Ketupat and Kuah Kacang (peanut sauce) somehow may be available all year round but during this festival it always tasted different. I can just have copious amounts of the two and nothing else and it would be the best time for me. Well this year since I did not have the time to visit due to classes and all, so I was spoilt by Hafiq who sent me my tray of goodies, nothing sweet just heaps of Carbs, yes you got it right, Ketupats (Note the plural sense) and Kuah Kacang. So my array of goodies, and we shall go clockwise, Ketupat, or Compressed Rice, Peanut Sauce, Ketupat Palas, Lemang and in the middle Rendang Minang. Briefly let me explain what is what and also how it can be prepared. 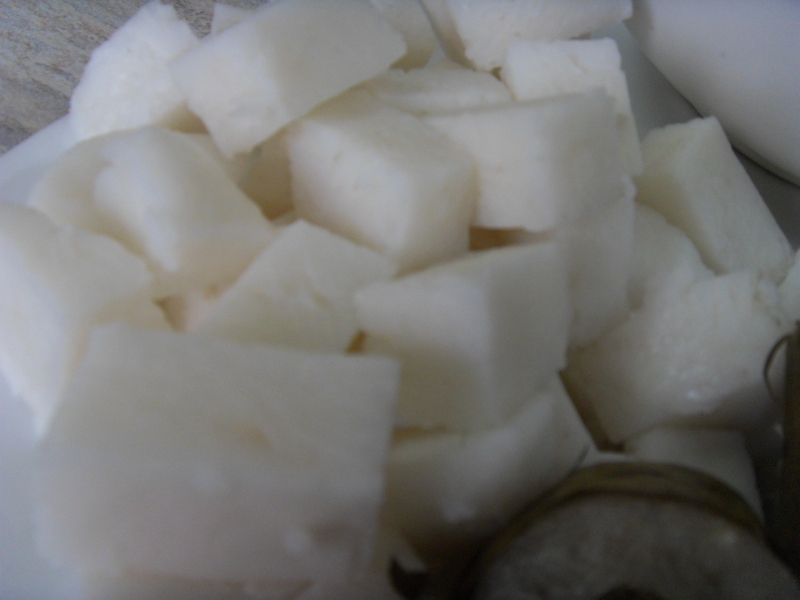 Now the Ketupat or compressed rice can be bought in little plastic sachets and boiled till done. The original one would be the ones wrapped in leaves which I had the previous day and forgot to take photos. Thoese were awesome. I should check to see if my market has them again before the season ends. 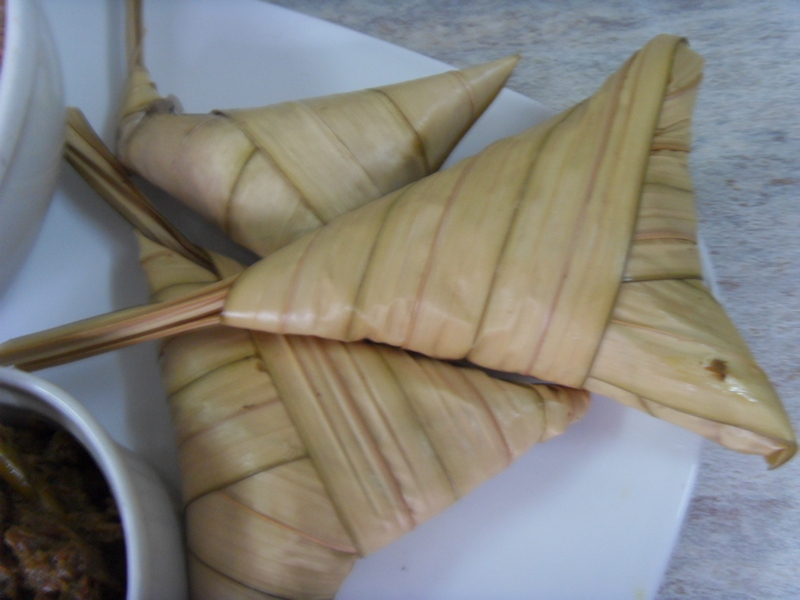 Ketupat Palas is made of glutinous rice and is wrapped differently compared to the rest. It is a flat traingle and I may be wrong but they use acertain palm leaves. 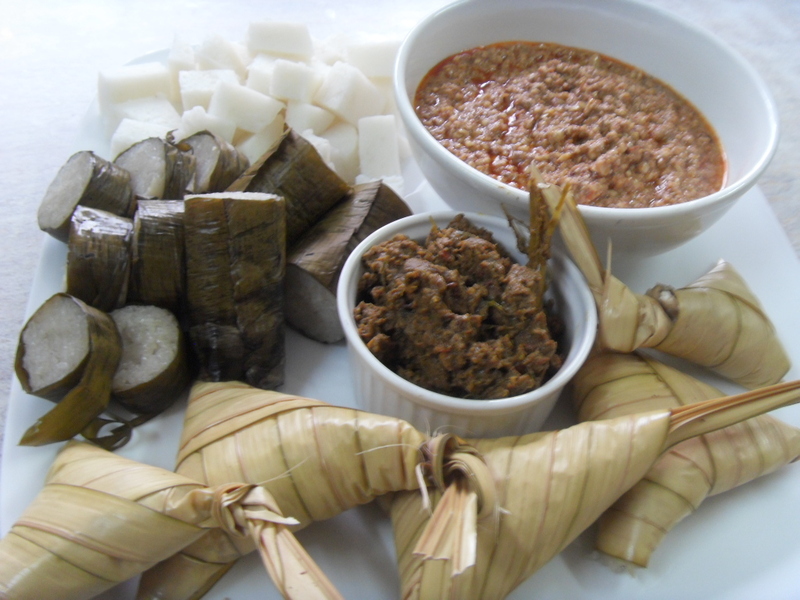 Ketupat Palas is not something all Malaysians make only certain groups do typically from the North, but I guess over time with migration and intermarriages, it is practically found all over. Puan Faridah Ketupat Palas had soy beans in it much like the Chinese Bak Chung except Bak Chung does not have any coconut milk in it. It is a tiny bit sweeter as well. Lemang is something a person like me would never make although I did try to make it in Australia for my friend Salmah Khalid, but I failed because I didn’t know how to start a fire and the fact that I had bamboo that could fit about a teaspoonfull of glutinous rice and I absolutely didn’t have any banana leaves which I actually forgot made the job very messy. So in the end I steamed it. Lemang is prepared over an opened fire. and takes a lot of time and people like me who never likes cooking outdoors it is something that I will not try. Lemang when made right with the right crispiness, is just wonderful to eat. The one Hafiq gave me seems to be the perfect size, not too thick. 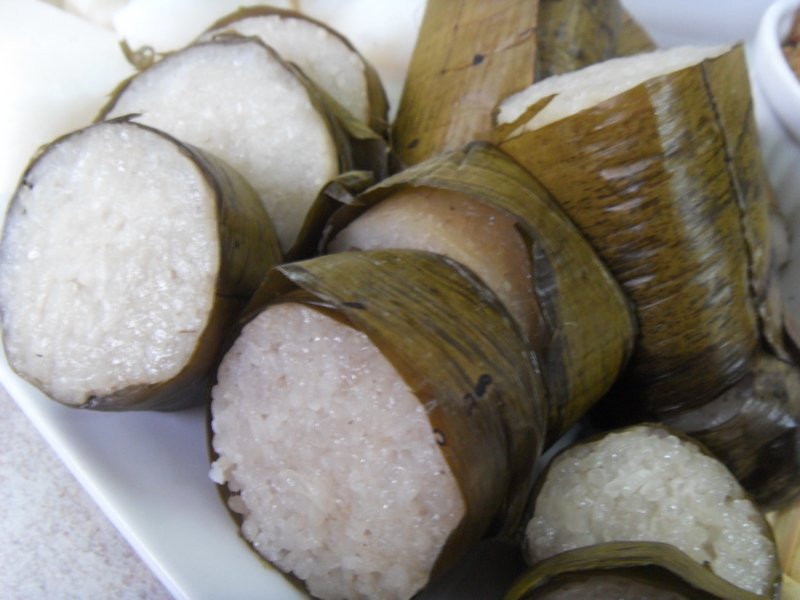 Lemang is rich and contrary to the belief that because it contains coconut cream it can get bad easily, this is not true. Well cooked Lemang, can last a few days even without refrigeration. And the bowl in the middle, Rendang Minang which I was just informed was a slightly tweaked recipe. It was wonderfully tender and actually tasted better the next day when I reheated it. The beef was cook to just the right toughness. I like my meat a trite bit tough so there is bite. 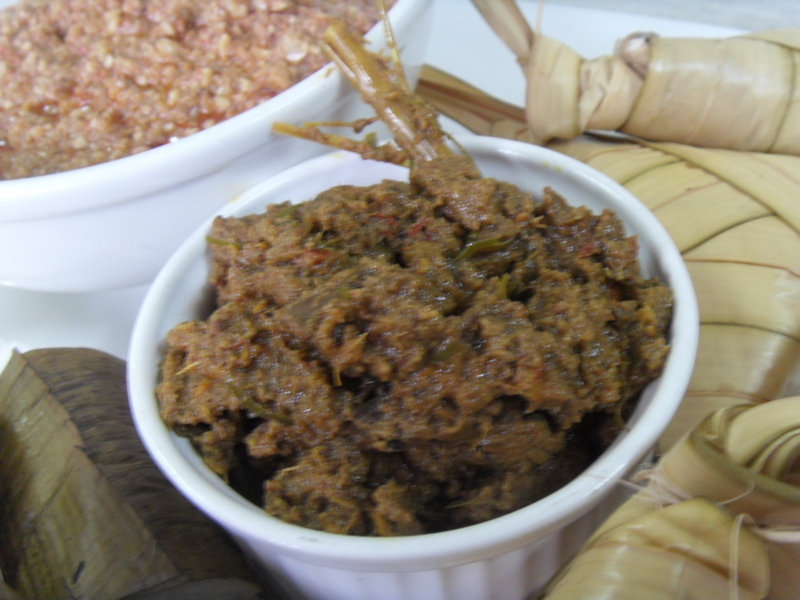 This Beef Rendang had spice in it unlike other Rendangs which usually have herbs like Lemon Grass, Galangal and Turmeric leaves. This was perfectly cooked for me that is. This takes hours to prepare and Puan Faridah, Fiq’s mum did all this in a rush only because I asked. I’m so rude. Finally, Peanut Sauce. Now I love Peanut Sauce. I don’t like my peanut sauce with Satay butI love it as a salad dressing of sorts. I love it with my ketupat any day any time. In fact as I am typing this I have the sudden urge to have it again. I wonder if the market has it today? 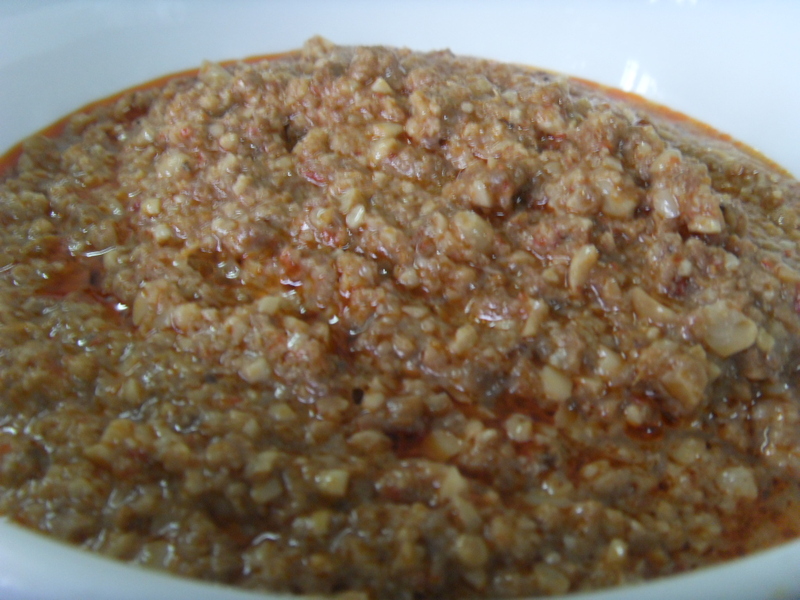 Puan Faridah’s Peanut Sauce is crunchy, and again this differs because some make it smooth like a broth, some make it half and half and some make it super crunchy that you are able to see who peanuts. I like mine half and half, a tiny bit sweet, and not too spicy. So there you go, my Hari Raya moment, thanks to Hafiq and his mum Puan Faridah. Thank you so much and Selamat Hari Raya everyone.